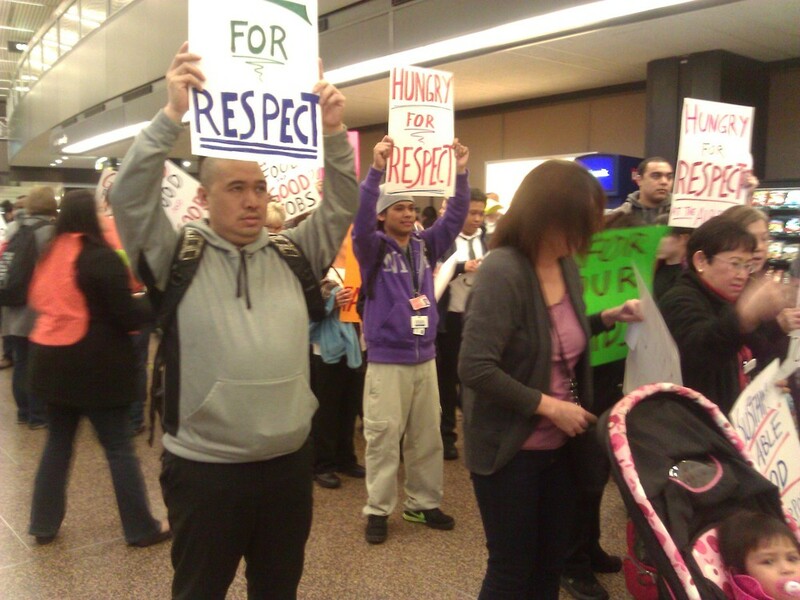 Waving messages on paper plates, airport food-service workers led a march through Sea-Tac Airport calling on the Port of Seattle to emphasize good food *and* good jobs at our airport. Port executives are currently considering changes in how food services operate at our airport that threaten to undermine the good jobs these workers have won over the years by joining together as members of Unite Here Local 8. Working Washington and other community supporters were there to stand with these workers as they marched and sang through our airport for good food and good jobs. We loudly sang a modified version of “We shall not be moved” and after crisscrossing the airport we arrived at the arrivals hall where workers shared their stories. Lourdes Barredo, who has worked for the airport for 21 years, addressed the crowd. The Port of Seattle is supposed to look out for the public interest, but they are pursuing a policy that will result in less stability, pay and benefits for airport food workers. The food concession workers have fought for and won decent wages, benefits and respect from their employer. They had to scrape and struggle for these benefits and they are not going to sit idly by while the public entity, the Port of Seattle, allows for profit companies to take them away. Too many jobs at our airport are poverty wage jobs. We've been standing up with workers who just want to be treated with respect and fairness. It doesn't matter if it is taking on the contractors that Alaska Airlines hires or speaking out for safety issues in front of the Port of Seattle. We will always be on the side of the workers who make our airport work. The Port of Seattle is a public entity and should be working to protect good jobs, not bust them up. Let’s remind them of that.